Closets are oftentimes packed full of clothes for all seasons, follow these tips for Simple Closet Organizing, and remember: Purge, Organize, and Maintain! 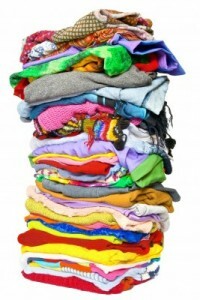 Purge Your Clothes – How many times have you pulled out that same top, only to say “This doesn’t look good on me”? If it’s more than once, be honest with yourself and donate the top. Fill your closet with items that you love, that fit you, and that are practical. It’s time to be honest and purge those clothes! If you went all spring/summer without wearing it, let the item go to someone who needs it. In with the Cold – The seasons are changing. Begin to work in clothes that you will wear in the fall/winter months. Store spring/summer clothes in a clearly labeled, clear plastic bin. Hangers – Now is the time to update your hangers. I love the hugable cloth hangers. These are so popular that you can pick them up virtually anywhere. Have the same number of hangers in your closet as you have hanging clothes. This alone will lessen the bulk in your closet. Rearrange – Hang clothes in your closet by article type. Put all short sleeved tops together, long-sleeved, dressy shirts, pants, etc. This will make picking out outfits easier. If you want to take it one organizing step further, group similar items together in their color order. Maintain – When you remove the item from the hanger, try to leave the hanger in the exact spot so it makes laundry day easier. This will help you maintain your newly organized closet! Use Your Space – Use all of the space in your closet. Pack lesser worn shoes or items in a small plastic bin and stack in the corner of the closet, or on the top shelf. Those places are tough to get to anyways, so leave the space for items that you don’t use often.